Brief Report on UBC’s visit to Kyrgyz Republic and WMF2018. 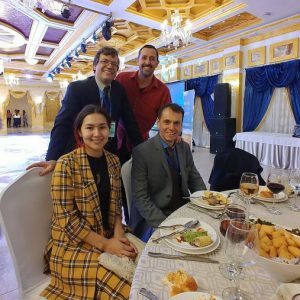 Fatima Mannapbekova, one of our research assistants, and Dr. Arthur Gill Green, our GIS course developer, attended the WMF2018 Conference in Bishkek, Kyrgyz Republic last October. Some highlights from the visit to the Kyrgyz Republic. They met with UCA faculty and MSRI staff to discuss project deadlines, goals of the trip, and local culture’s impact on students’ learning expectations and behaviours, which seems very symptomatic. Gill met a possible GIS instructor at UCA and they agree that the open source software and internal data sets from research institutions work best for students. They talked with UCA students about their desire to learn GIS. As students are very enthusiastic and seemingly very resourceful, aspiring to pursue careers that make use of GIS, Gill identified “professionalism” as a new addition to overall learning outcomes. He is also considering integrating a portfolio component to the learning assessment which students will be able to show to future employers. Gill with five other conference attendees visited the Naryn campus. The overall goal was to see and learn about the quality of the facilities, how students were living, how were students doing in the academic programs, were there lessons learned from the delivery of other courses. and the general context within the community. 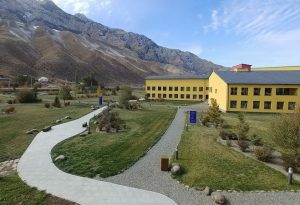 UCA’s Naryn campus, next to Naryn river. The first day of the conference was set to coincide with the International Snow Leopard Day to emphasize how this keystone species is an indicator for the sustainability of mountains throughout the region from the Himalayas to the Altai. The conference was split into four thematic tracks. Each track was given a separate room. Fatima spent most of her time in Track 3. Investing in Mountains – Securing the Future. Gill and Fatima were both excited to meet some of the global leaders in the WMF meeting. Fatima represented the UBC-UCA curriculum development partnership by presenting a poster about the project. This provided a focus to clearly explained to people the goal and components of the Earth and Environmental Sciences B.Sc. degree being developed for UCA. Talking with student volunteers during breaks was particularly rewarding. For example, they discussed gender imbalance in the EES program with majority boys. Nevertheless, both boys and girls expressed genuine interests for the subject and the importance for them to be studying this degree. Students and faculty recognize that local people (including parents of current and prospective students) seem to be unaware of the content of the program and the career potentials associated with the Earth and Environmental Sciences degree, which may put pressures on students who decided to pursue this degree. While there was a wide range of topics that had varying levels of quality regarding evidence and research, people at the conference often spoke of the beauty of mountains and their own identity in relation to mountains. Both Gill and Fatima found this “personal relationship” fascinating and important. Gill mentioned that talking about identity and community centered on a natural feature is rare in academic conferences on environmental issues. The conference was very policy focused on generating a “Call for Mountains” declaration. Both UBC delegates agreed that the most interesting presentation was Sonam Wangchuk – from Students’ Educational & Cultural Movement of Ladakh (SECMOL) – presented on the Educational and Cultural Movement of Ladakh initiative in the trans-Himalayan desert of northern India, which has pioneered an alternative education system suited to mountain culture and ecosystem. Fatima was able to talk with Mr. Wangchuk in depth. Gill traveled with him to Naryn and discussed the UBC/UCA partnership. While interested, it is clear that intra-region collaborations are of most interest, rather than interactions with European or North American organizations. 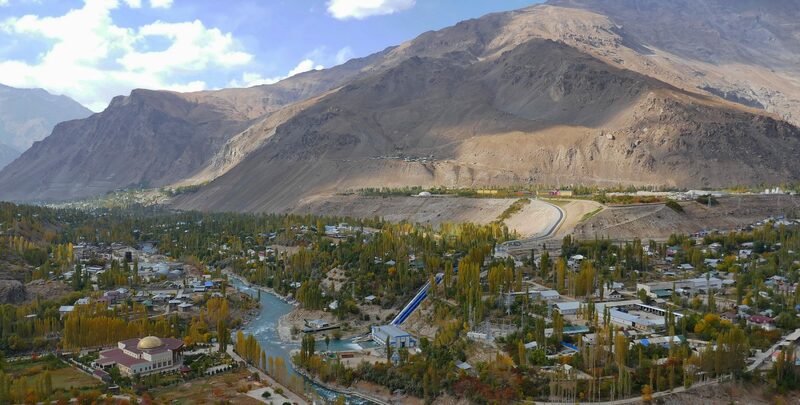 Visit to Tajikistan for geology course development. September – news from UCA.